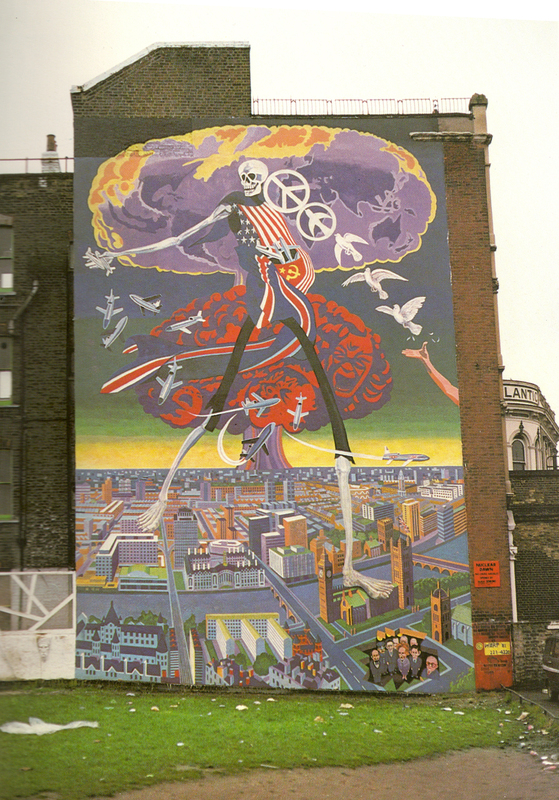 As many of you will remember, the London Mural Preservation Society (LMPS) was quite concerned about the proposed development affecting Carlton Mansions, the building on which the 1981 mural Nuclear Dawn is painted. We were informed that the plan was for the mural to stay but without this in writing we felt a petition was needed to show how much the mural was supported locally and further afield. Over a thousand people responded to our petition proving the popularity of the piece. The mural in its original state. We also applied to English Heritage to get it listed. Although it is considered to be an important artwork, it wasn’t seen to be at risk from demolition and therefore no listing took place. The mural is locally listed but this offers little protection as we have seen with the recently demolished Mauleverer Road Mural. The petition and listing application took place in the spring of 2013. Since then nothing has been done to preserve the mural which is rapidly continuing to deteriorate. Carlton Mansions was emptied of its residents in September 2014 leaving the building at risk of becoming derelict or, worst case scenario, going up in flames. The LMPS have been involved in meeting with key stakeholders working on the development of the site. They still plan to retain the mural and have it repaired but progress is slow. The focus is on trying to bring Carlton Mansions back into use as quickly as possible and once work starts on repairing this local landmark, we would hope that all would be in place for the restoration of the Nuclear Dawn mural to start. We hope to meet with the architect who will be working on this project and will update you with any significant news. This entry was posted in London Mural Preservation Society, London Murals and tagged Brian Barnes, Brixton, Community Murals, Lambeth, London, murals, Nuclear Dawn. Bookmark the permalink.